Designed to identify drivers of declines in herring populations, the quantitative herring project is well into its first year of life. The project is a response to herring declines on the Central Coast of British Columbia where diminished stocks, fisheries, and spawning events have lead to hardship for many communities. Through a focus on the Central Coast, the scope of the project has grown to span the Northeast Pacific coast from San Francisco Bay to Norton Sound in Alaska. The experience and records of resource managers from a broad portion of our coast may help to identify drivers of herring declines in Central Coast waters. In turn, knowledge generated at a broad coastal scale may be valuable to communities outside the Central Coast that depend on herring for livelihoods or ways of life. 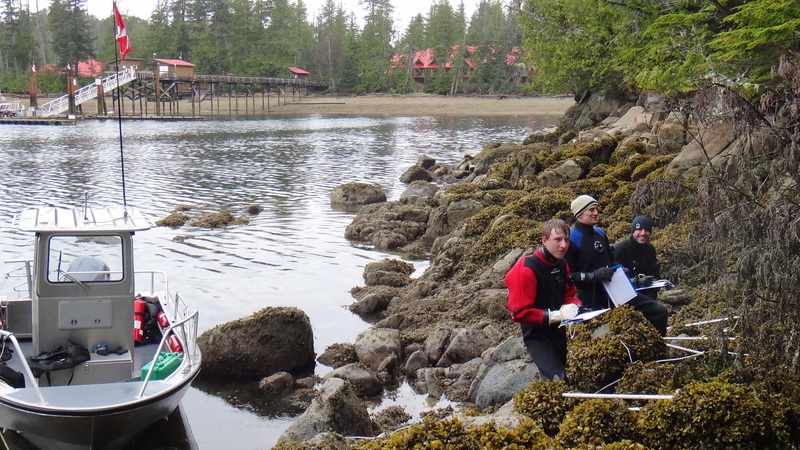 The project is led by Luke Rogers of the Hakai Network, and is a collaboration with fellow Herring Schoolers Anne Salomon and Margot Hessing-Lewis, Brendan Connors of Simon Fraser University, and Martin Krkosek of the University of Toronto. Stage 1 is nearly complete. Records have been generously provided by Fisheries and Oceans Canada, California Department of Fish and Wildlife, Oregon Department of Fish and Wildlife, Washington Department of Fish and Wildlife, and preliminary data from Alaska Department of Fish and Game. Stage 2 is expected to begin in early September 2013, when Luke arrives in Toronto to collaborate with Martin Krkosek’s lab group at the University of Toronto. 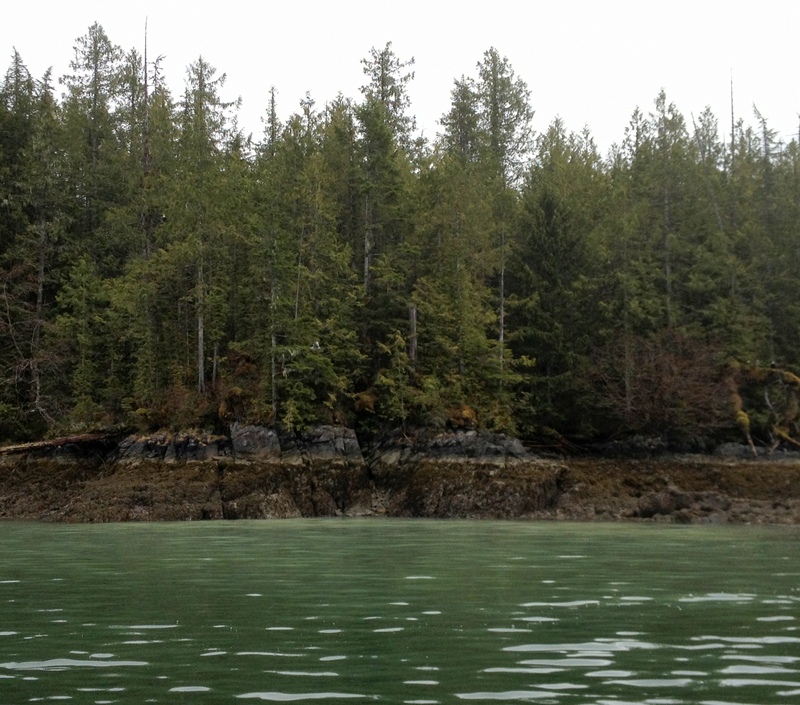 Subsequent work is planned to take place at Salmon Coast Field Station in the Broughton Archipelago, the Hakai Network at Simon Fraser University, and the Department of Ecology and Evolutionary Biology at the University of Toronto. 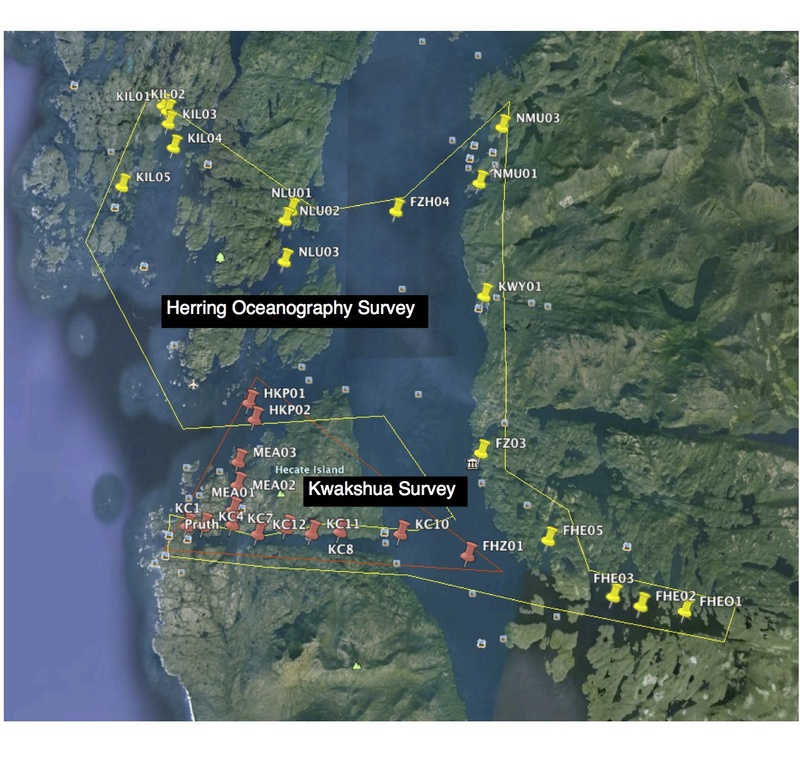 Hakai Beach Institute’s (HBI) herring monitoring currently consists of 4 components that are meant to track herring spawning events spatially and temporally. Through a long-term monitoring program we will address questions related to interannual variability in spawn size and location, as well as the physicochemical variables and substrate choice influencing herring spawning events, development and growth of early life stages. A brief overview (below) outlines our current monitoring methodology. To map the total length of the shoreline where herring roe has been deposited, we conduct surveys at low tide and note the presence and absence of herring roe. We use binoculars to look for telltale sign of seaweed coated in roe from afar (white coloration, bumpy texture), and jump ashore if a close-up visual ID is warranted. These surveys do not quantify spawn events that occur in the middle of the channel or in deeper waters, but can be used to record the general shoreline extent of individual spawning events. 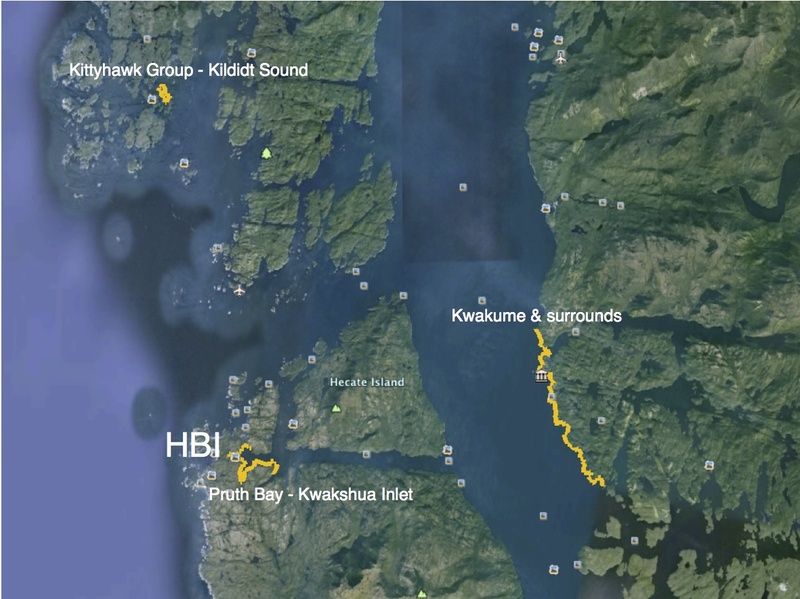 Map showing the 2013 spawning events in the Hakai environs: Spawns occurred in Pruth Bay (Kwakshua Channel), Kwakume Inlet (inside and outside the Inlet), and Kildidt Sound (Kittyhawk Group). To determine how deep, and how far from shore, the herring spawn extends, divers conduct transect from the deepest extent of spawn to the shallowest extent of spawn. The shallow sites are often located in the intertidal, so these can be conducted without diving (see photo below). Divers swim in teams up the transect line and use quadrats to sample the substrate on which the herring spawn. Quantifying herring roe consists of measurements of percent cover, and egg layer thickness on the available substrates in the quadrat. This methodology has been adapted from DFO spawn surveys, which are conducted annually. In addition, the HBI dive surveys also quantify all the fauna present in the quadrat (namely invertebrates). Using the information from the dive surveys and the mapping, the average abundance of roe can be scaled up to provide estimates of the total amount of herring roe deposited at a spawn location. Using oceanographic sampling equipment, key physicochemical variables are measured that may affect the location, timing and duration of herring spawning events. These measurements are also part of standard HBI oceanographic monitoring which includes sampling of key parameters at designated stations in Kwakshua Channel (the Kwakshua Survey). CTD (conductivity, temperature, depth sensor) measurements are taken at all stations, with additional sensors to measure a host of key water column parameters including dissolved oxygen, fluorescence, and PAR (photosynthetically active radiation nutrients). Light attenuation is measured using a Secchi disc, and a Van Dorn water sampler is used to gather nutrients, chlorophyll (phytoplankton pigment), and POM (Particulate Organic Matter) at two depths (5m, 30m). 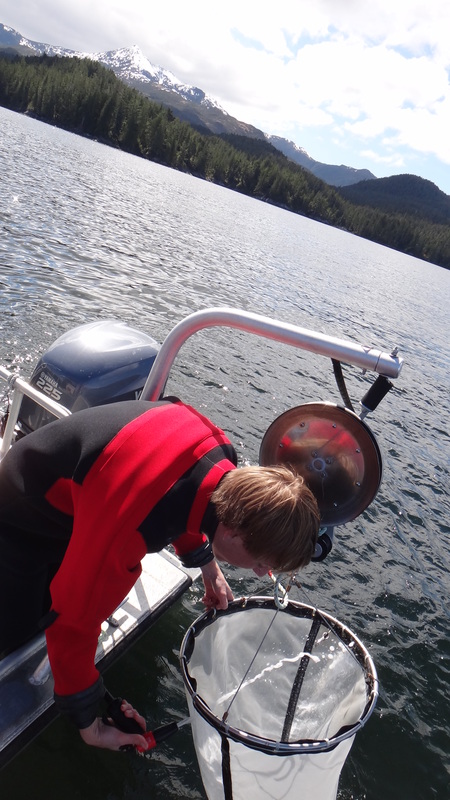 During the HBI herring monitoring, the oceanographic survey is extended to encompass the entire region around Calvert Island where herring spawn events are monitoring (Herring Oceanography Survey). Throughout the month of April, the oceanographic work in Kwakshua Channel and the larger scale survey is ramped up, sampling at higher frequency to ascertain the factors at play in herring spawn events and early life history. The numbers of herring eggs (roe) deposited on the shore is truly outstanding, but how many of these actually survive and make it to return to spawn as an adult? How does this change from year to year, and what factors affect herring development? To answer these questions we are monitoring herring egg development, as well as herring larvae that hatch out and become planktonic. 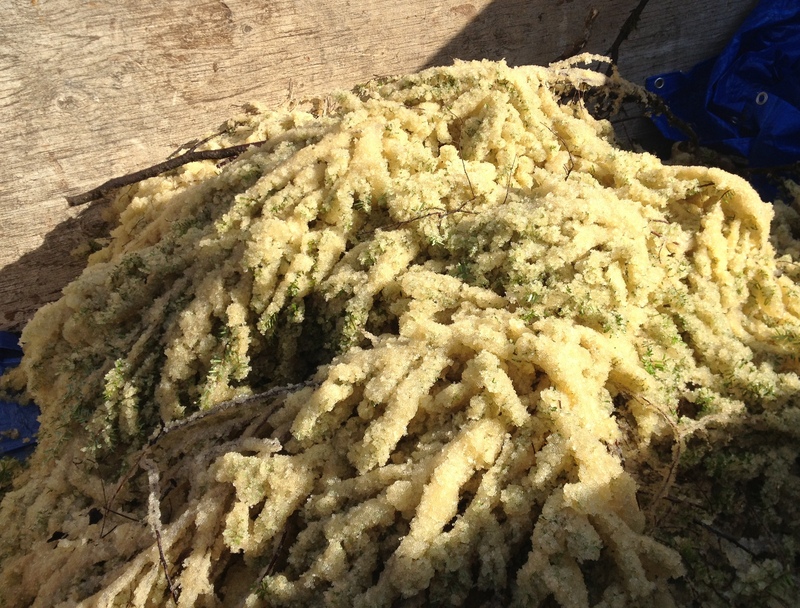 Herring egg development is monitored on blades of seaweed (Fucus gardneri – see photo below). 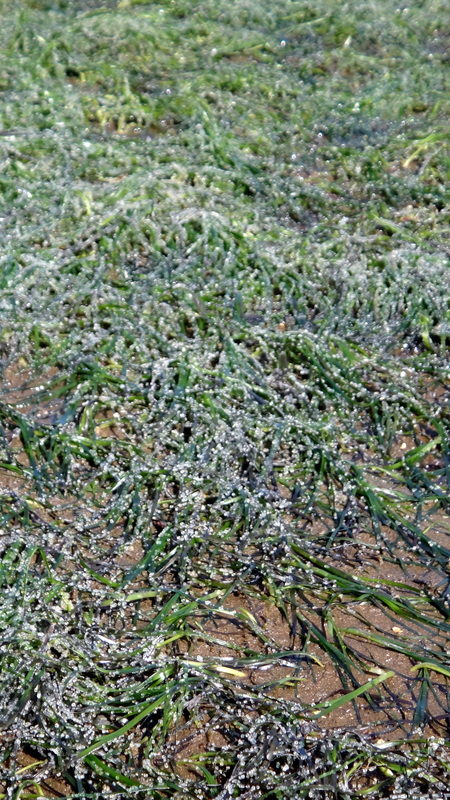 At 3 day intervals post-spawn, Fucus is collected at three of the Pruth Bay spawn sites. Ten blades per site are examined under the microscope and percent cover of the different stages of embryo development are recorded. Unfertilized eggs, hatched-out eggs, and decomposing eggs are recorded. This survey provides a chronology of herring egg development, and will be repeated yearly at proximate spawn locations to HBI. Once the herring roe have hatched out, larval sampling allows us to quantify their size, abundance, and source of food (planktonic prey). This sampling is conducted at the oceanographic stations, with concerted effort in Kwakshua Channel this year. Bongo nets are used for these plankton tows to catch both larvae, and their sources of food. 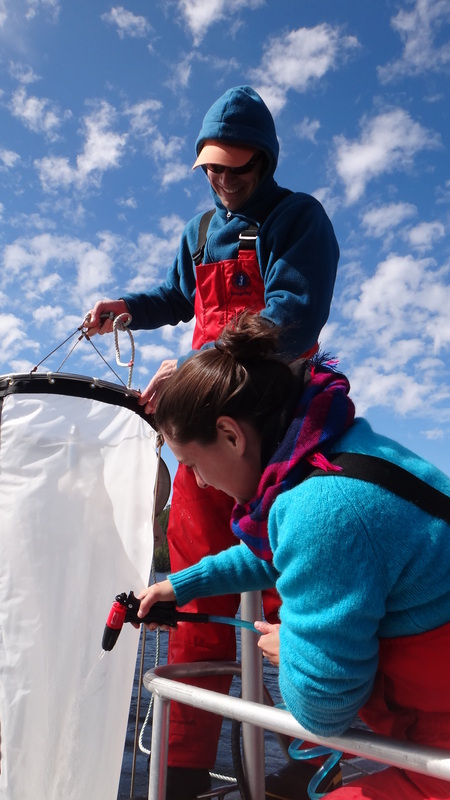 Sampling for herring larvae is conducted for a month after the spawn to quantify their growth rates and distribution. 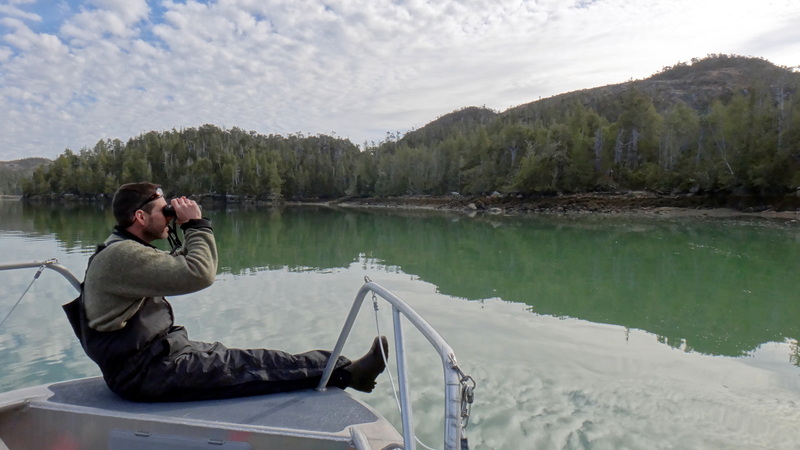 Thanks to a terrific team at HBI, and a fortuitous spawning event right in Kwakshua Channel, the inaugural year of herring monitoring was a huge success. 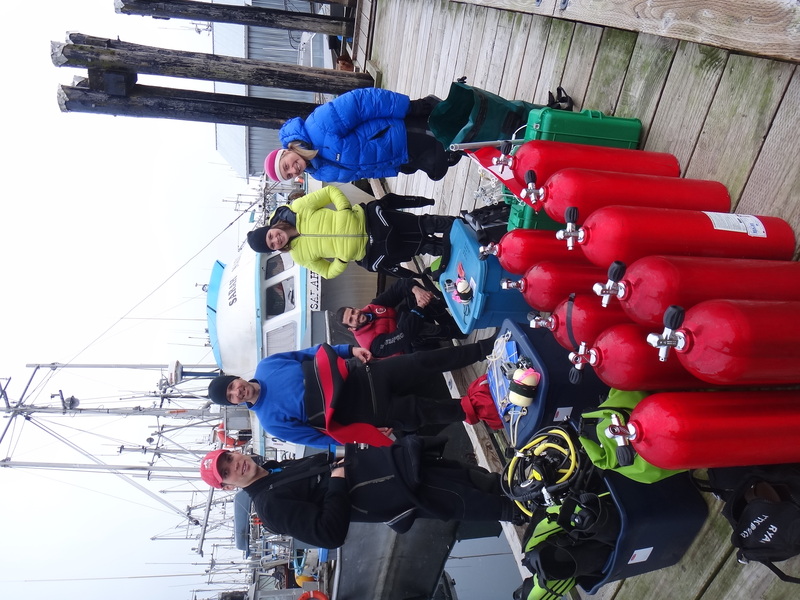 The team included HBI oceanographers and divers: Skye McEwan, Brent Callegari, Rod Wargo, Dawson Korol, Nelson Roberts, and was overseen by Dr. Brian Hunt and Dr. Margot Hessing-Lewis. Thanks also to the amazing chefs for feeding us so well, and the rest of the awesome HBI staff. Looking forward to Herring Season 2014! 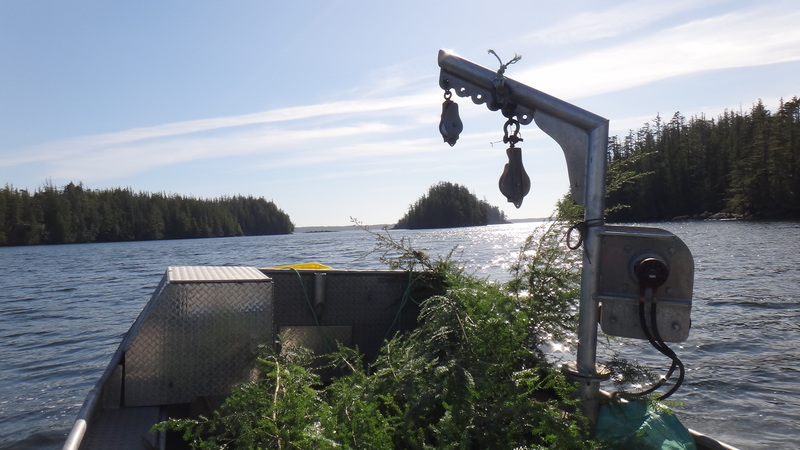 After a week in Bella Bella, we headed down South to the Hakai Beach Institute (HBI) on Calvert Island for the next two weeks of “Herring Season”. 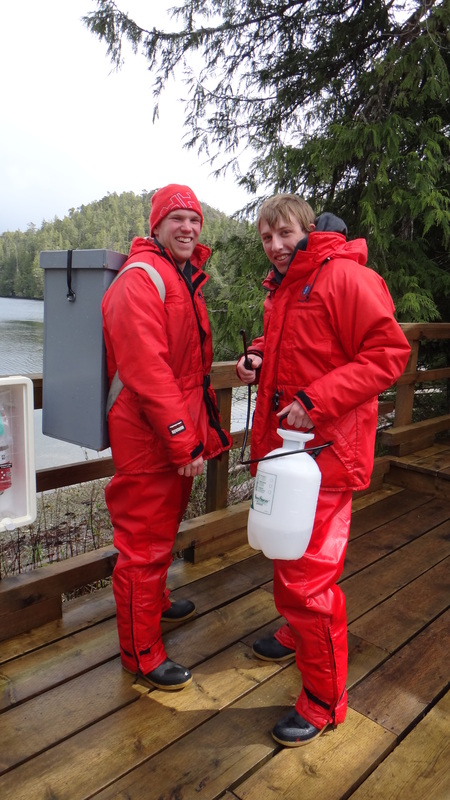 Brian Hunt (UBC Oceanography) and I (SFU Hakai Network) were helping to help set-up a long-term monitoring program for herring in the region around Calvert Island (HBI). This program would be based off of the work and knowledge we’d gained throughout the past couple of years of Hakai Network herring research on the Central Coast. HBI’s marine monitoring program is interested in documenting and quantifying long-term patterns in forage fish ecology. Herring, being a quintessentially important coastal fish in B.C., is a natural species to feature as this program develops. We planned to document, in detail, the areas where herring spawn in the region around Calvert Island (home to HBI), and gather information on the early life history of these fish, after they hatch out. HBI personnel had been sending us e-mails in advance of our arrival, noting a lot of marine mammal activity in the region, including humpback whales, sea lions and scoters – signs that herring were gathering in the region. DFO had already reported a spawn event in Kwakume Inlet, but we had no reason to believe that the herring were planning a surprise for us. It turned out, however, that they had sent a welcome wagon to the head of Pruth Bay for our arrival on the last day of March. That night, we heard splashing to the south of the HBI dock. 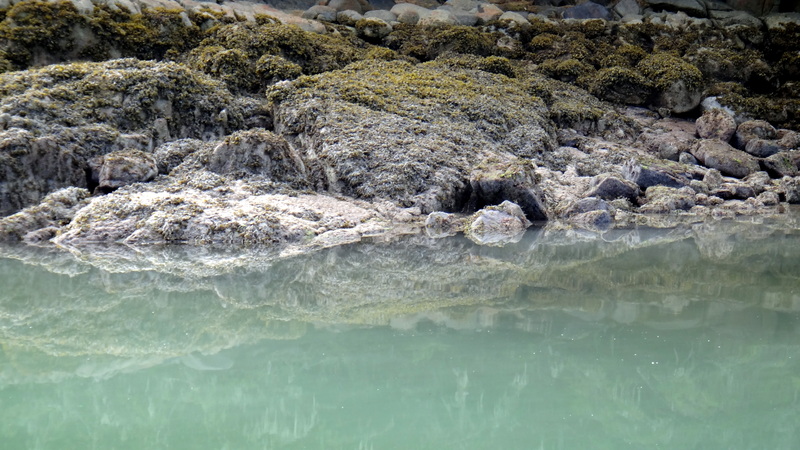 I crept closer, over the slippery boulders exposed at low tide to look for sign of spawning herring. 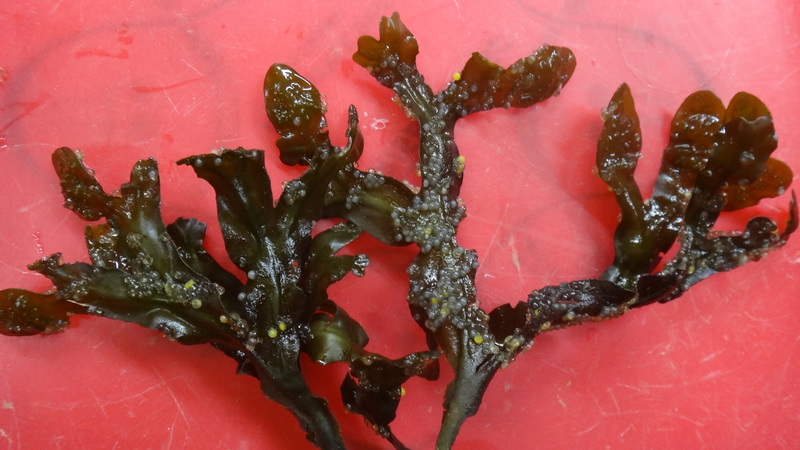 I found some eggs, stuck to the rockweed (Fucus) growing in the high intertidal zone, but it was pretty sparse. But as I stood there, quietly gazing for more signs of fish in the water, it became suddenly dark with a stampede of fish. Now I know why the analogy of herring as equivalent to Wildebeest in the Serengetti is actually a good one! Once the procession started, it didn’t stop, and from my very close vantage point I could seem them all, moving as a group under water, occasionally flashing their silver sides. There’s a lot left to learn about spawning herring: what lures them to a given location to spawn, which substrates they prefer to deposit their eggs on; what the ultimate trigger is to start a spawning event; how their spawning behavior is affected by age and size. Science has some answers to these questions, but there remains a lot more to explore, and we hope that a monitoring program will contribute to this. The next morning we realized that the herring were still hanging out locally, in fact, they had started to spawn right underneath the HBI dock, on a beautiful patch of eelgrass. From our vantage point, it really looked like the herring were enjoying the eelgrass, rubbing up against every shoot they could find. Back in the ‘70s and 80s, and even throughout most of the 90s, there was almost always an annual spawning event in Kwakshua Channel, albeit its size (measured by its length and width; the distance to which herring roe extends along the coast and out from shore) varied between years. Its been two months now, since herring season. It was such an exciting year that its taken me awhile to get around to posting on our research blog. My arrival in Bella Bella this year proved to be a good premonition of the herring season to come. Valentina Savo and I (Margot Hessing-Lewis) had only just settled in to the floathouse, when we got an invite to check out rumors of a spawn in Troup Pass. The punt carried us to familiar territory (from fieldwork in 2012 and 2013) and we scanned the shoreline in search of the telltale sign: bird life! A flock of gulls and a diving line of white-winged scoters drew our attention around the corner, and the sea lions beckoned us into a little cove, where they were driving fish to the surface. Surges of silver flashed through the surface in a moment of flip-floppin’ excitement as the sea lions drove the spawning fish towards the shore. It was a grey day, but the glacial greens of the spawning event permeated the water near the shore, spreading and growing larger as we watched. Just my luck to have arrived on one of the first days of herring spawning activity! I went home and sent pictures to all the collaborators I had recently been corresponding with on a big NSERC proposal; I knew they’d all be excited to see photos of herring, doing their thing, in situ. I spent a week in Bella Bella, working with our local partners (HIRMD and GRS) on another funding proposal that I’m working on. In general, we’re aiming to continue our research on herring as a coupled social-ecological system. We’ve done good initial work on the ecology of herring spawn (Britt Keeling just defended her thesis and is about to submit a manuscript on this work), and we have a team of social scientists looking at traditional use and management of herring. Up next, I’d like to bring these two components together. It was great to be back in Bella Bella, after visiting here for Herring Season in 2011 and 2012 I’m beginning to see a lot of familiar faces as I walk the streets, and feel very welcome. And, the work couldn’t be done without the local support that the Herring School is getting from our collaborators; its always great to touch base in person when I’m here. Back on the water the spawn locale moved quickly from Troup Pass to Spiller Channel. We went back out on our last day to help set some trees, and were visited by a big Humpie who surfaced about 10 m from the boat! As usual, we heard his breath, a big blow of an exhale, first. He passed right by the bay where the line was set; I guess the whale had already had its fill of herring and wasn’t in the mood to munch on these spawners. I’ve heard reports from locals that this year had the greatest spawning activity in the past 7-12 years. 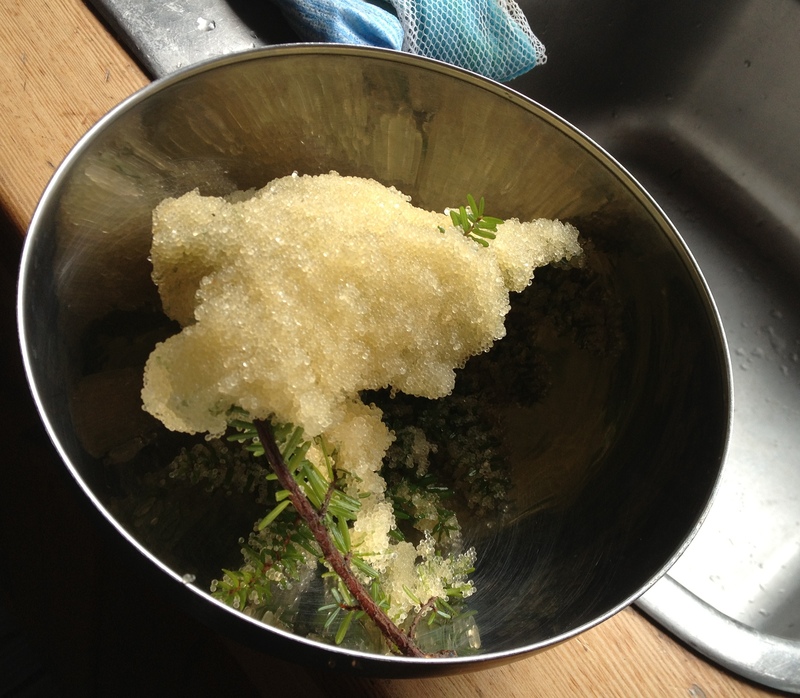 And I’ve seen pictures of people in Bella Bella, smiling while holding a thick branch of herring roe on hemlock or yaga (stringy seaweed – Egregia menziesii). I hope this bountiful spring heralds a great summer ahead. We are pleased to introduce our Herring School social science researchers that are currently up in beautiful Bella Bella: Alisha Gauvreau (Master’s Candidate, School of Resource and Environmental Management, SFU), Jennifer Silver (Assistant Professor, University of Guelph), and Maria Shallard (Incoming Master’s Candidate, University of Guelph). Alisha’s been up since early April, working with Jennifer Carpenter at the Heiltsuk Integrated Management Department (HIRMD), and getting to talk to local fishermen and other community members about how the Heiltsuk managed Pacific herring in the past, and how these strategies have evolved over time. 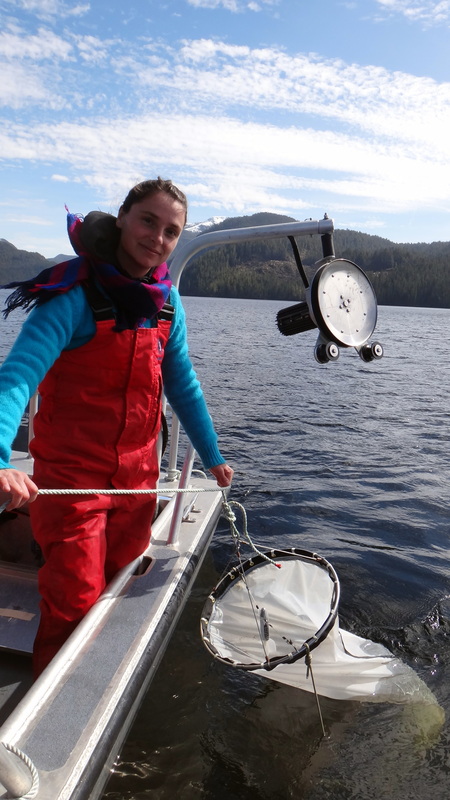 Her research focuses on documenting the components of the Heiltsuk management system for Pacific herring, with the aim of informing more active adaptive strategies and governance of resilience within social-ecological systems involving Pacific herring in BCs central coast. This preliminary research phase has involved exploring Heiltsuk reports and technical documents housed at HIRMD and at the cultural center, as well as conducting some interviews with Heiltsuk community members to better understand the management challenges that the Heiltsuk are facing today. Alisha’s also been fortunate enough to get out on the water with Clark Housty and our film crew, as well as with Keith Gladstone to hunt for herring throughout the territory. 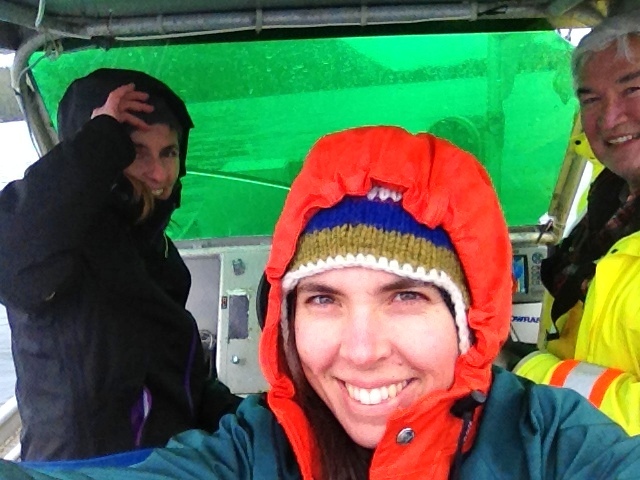 The next phase of Alisha’s research will involve a series of semi-structured interviews in June 2012 to document how Heiltsuk management strategies for Pacific herring have transformed from pre-contact times until present. Jennifer and Maria arrived this week, and are looking forward to meeting with community members to discuss research ideas and concerns regarding Pacific herring governance. 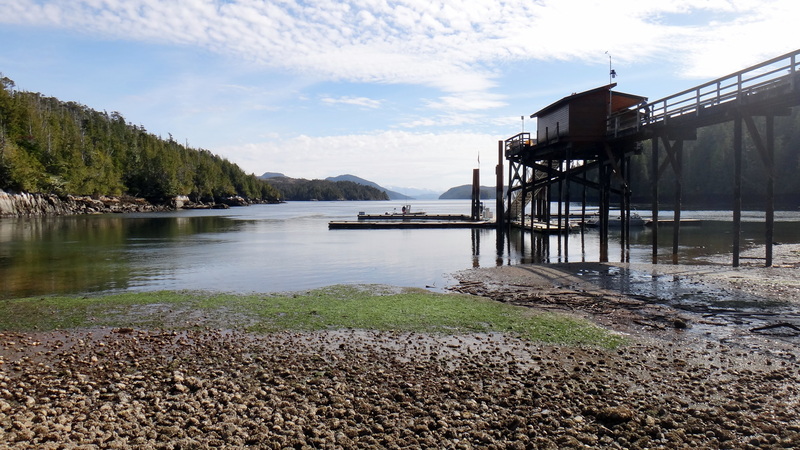 Now that we’re finished with our northern sites around Bella Bella, we’ve moved to the Hakai Research Institute on Calvert Island. 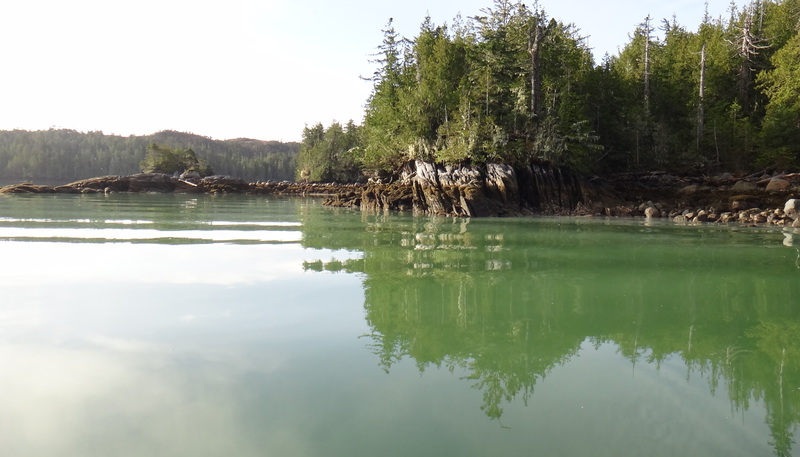 Hakai is proving support for our research at the Southern sites: Kwakume Inlet, Kildidt Sound (SW of Goodlad Bay) and Mustang Bay. We only have one sampling day left to go for each of these sites, after which we’ll have completed 5 survey dates at all nine sites – quite an accomplishment (and a lot of data for Britt to start entering and analyzing!). We had help last week; Dr. Anne Salomon, a principal investigator with the Herring School, and Dr. Scott Wallace from the David Suzuki Foundation. They collected data on fish and invertebrate abundance at shallow and deep depths at each of our survey sites. This provides additional data on potential herring roe predators at all the sites. They made it to all nine of our sites, and we spent the night at Hakai as we did the rounds of both North and South sites with our captain Carl (Cal). At Hakai, Wayne has been helping us as our captain for the past couple of excursions. Before this, Rod and Skye came to our rescue in Spitfire Channel, and Eric helped us set up the sites initially. Not only has Hakai allowed for quick access to our Southern sites, but the food here is spoiling us; will it be fresh apple pie, or pavlova for dessert tonight? Great news!! We have finished monitoring five sites around Bella Bella, meaning we dove each of them five times over a two and a half week period. This is a welcome achievement as five sites was originally deemed the minimum requirement for this season. If everything goes smoothly we will have nine sites completed by the time we wrap up in two weeks. Another exciting achievement was today’s dive tally roll-over to 51 dives since arriving. Thanks to great help and coaching from our in house dive experts, Ryan and Yago, both Margot and myself have become very comfortable and well acquainted with the underwater world. Despite continued sub-surface excitement, we are looking forward to a much-deserved dry day on land tomorrow after a solid 10 days straight of diving. We changed venues as of yesterday to give us faster access to spawn sites located South of Bella Bella. We are now staying at the Hakai Institute on Calvert Island (http://hakai.org/), and have been spoiled with amazing staff support and delicious food. We will be here for roughly 10 days before making our way back to Bella Bella to pack our gear and wrap up another successful field season. Below is a slideshow of time-lapse images caught by one of our GoPro cameras. The Pycnopodia is likely vacuuming up herring roe!